I went skiing this weekend and hadn't gone for almost 6 years. The last time I went I was an innocent high school student and had never lived anywhere else but in France. A lot, a lot has changed since then, although hitting the Quebec slopes again brought back some of those memories. I used to ski in Switzerland for a week a year, take in the nice fresh air and indulge in the outdoor sports I had very little of during the year in Paris. It was total bliss. Skiing, of course, was always rewarded by our favorite ski foods. Raclette has to be my ultimate favorite (amazing gooey cheese served over potatoes, cured meats and cornichons) and the best way to spend a cold night in the mountains. A close second has to be Fondue Bourguignon, an easy dish to make at home during the year. Here is my basic recipe along with two sauce ideas (that I should thank my mother for!). My mother is the queen of homemade mayonnaise. She has been whipping up homemade mayonnaise for years and has never even thought of having a jarred mayonnaise in the house. Neither have I, I must add! It is so easy to make and the end result is really worth those extra minutes in the kitchen. Here are two of the recipes my mother and I usually make for fondue, as well as adding a few flavored mustards and aioli. Place the oil into the fondue pot on medium heat. Make sure the fondue is never more than 2/3 full. Serve with the cubed meat and dipping sauces. Place the mayonnaise in a small bowl. Fold in the parsley, mustard, capers, cornichons and lemon juice. Taste and adjust seasoning with salt and pepper. Place the mayonnaise in a small bowl. Fold in the ketchup. Adjust with extra ketchup if needed. I'm not sure what sounds better the fondue or the ski trip. I would LOVE a little of both! What a lovely, enticing photo. This fondue sounds fantastic! fondue and skiing?! yes please! Its been forever since ie had a good fondue! Gosh, I would give anything for either one...the food or the skiing!!! Your fondue sounds fabulous. My mother always made homemade mayonnaise too. When I was very young, I didn't realize you could buy it in a jar at the store. I was spoiled. Great recipe. Oh my! This looks amazing. I haven't had fondue in sooo long. LOVE this. reminds me so much of switzerland and alpine cottages. I gave up my pot but remember how much fun it was with all the little forks in the pot and the laughter... it is a lovely memory... maybe I should revisit?? 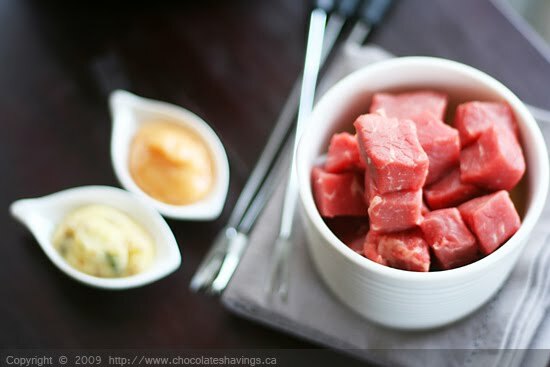 Beef fondue was my youngest son's favorite dinner. He asked for it every year on his birthday- and from a young age, too. I must have been experimenting with it way back then! Fun for everyone and the dipping sauces really make the dish. Now where did I stash that pot?? I'm glad you had so much fun skiing! I've never gone skiing before... :) The fondue sounds amazing too! O it's been so long since I last went skiing that I will probably break a leg if I go again...lol... Love the fondue!! this sounds delicious and oh-so comforting. Mmm, delicious looking fondue! I'd love to go skiing, especially to France, so I could eat raclette and other delicious cheeses! Yummy :) Beautiful photo! This is perfect aprés ski food. That homemade mayo sounds awesome! Makes me not want to buy the jarred version ever again. How long does that mayo stay fresh? We are in Telluride skiing the past two weeks...with I had some of this Fondue! I've never tried skiing would love to one day! The fondue sounds amazing. How lovely that you went skiing! Must have been lots of fun! I come from a tropical country so when I first skied I was enthralled! Your Beef Fondue sounds delicious - perfect after a day of skiing! And your Mom's recipes sound fantastic as well! Sounds amazing. Oh, that herb mayo... This recipe is such a perfect food idea for a weekend! Beautiful photo! I love fondue, this sounds fabulous! i do not know how beef fondue works? it is raw when you eat it?